Created by us in late 2014, ESL Careers is a specialist teacher recruitment website focussed on worldwide job vacancies for ESL Teachers. The site was designed to allow employers to post teaching vacancies online and to allow candidates to send applications directly to employers. In addition, employers are given access to a private area on the site where applications are stored. Job adverts can be modified, cancelled, deleted or created easily and are given an automatic expiry date, meaning employers don't even need to delete old adverts. As the ESL Careers website needed to incorporate complex registration and display functions, we chose a Wordpress CMS website for the design. As a specialist website, the site was never predicted to carry large numbers of vacancies, but has nonetheless featured and provided candidates for several hundred jobs since inception. 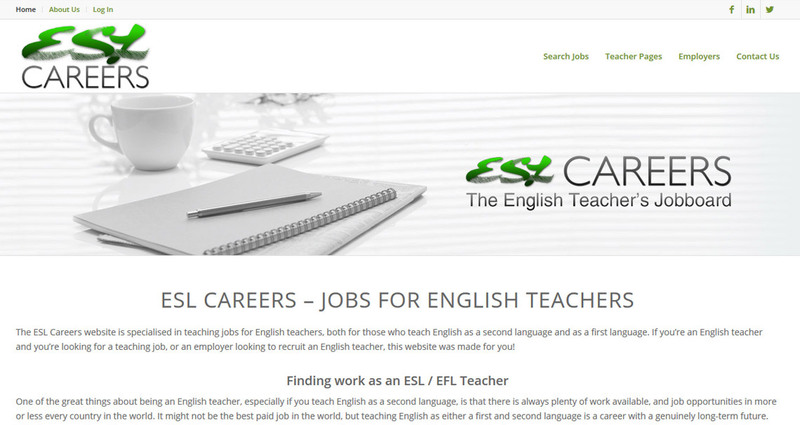 The ESL Careers website is based on WordPress. Using Wordpress means that the site managers are able to add or modify pages whenever they wish. Additional software allows employers to register on the site and post job vacancies without any management involvement. The site is hosted on our servers and we manage security, backups and program updates. Costs for a similar site; approximately £800 - £1800 depending on page numbers, required features and functionality.